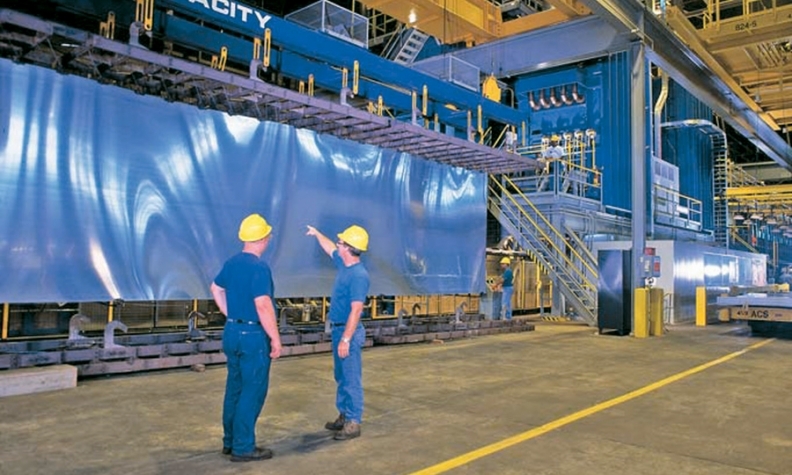 Alcoa is expanding aluminum sheet production at its Davenport, Iowa, plant. The company expects that consumption will triple by 2015 and that growing demand from the auto industry could cause shortages next year. Automakers are expected to triple North American use of aluminum sheet by 2015, a surge that could lead to spot shortages. To meet demand, two major aluminum producers are adding production capacity. Last July, Novelis Inc. said it would spend $200 million to improve its rolled aluminum plant in Oswego, N.Y.
And in September, Alcoa Inc. announced plans to spend $300 million to expand aluminum sheet output at its Davenport, Iowa, plant. The expansion will be completed in 2014. In an interview, Randall Scheps, Alcoa's marketing director, predicted that aluminum sheet consumption will triple by 2015 and that the auto industry's growing appetite for aluminum sheet could cause shortages next year. "We have said that things are going to be very, very tight in 2013," said Scheps, adding that Alcoa will be able to fill its customers' orders. Automakers have made wide use of aluminum wheels, engine blocks, heat exchangers and suspension components to save weight. Now they are using more aluminum sheet for hoods, liftgates, fenders and doors. And they are starting to design aluminum bodies-in-white, Scheps said. A body-in-white is a vehicle's structural skeleton before doors, hood, powertrain and other components are added. Within three years, an Alcoa customer in North America will build a vehicle with an aluminum body-in-white, Scheps said. "We are working on a variety of projects ranging from production contracts to advanced development," he said. Scheps declined to identify the automaker. In Europe, Audi and Mercedes-Benz have produced vehicles with aluminum bodies. Automakers have been spurred to cut weight by tougher U.S. corporate average fuel economy regulations, which under the current administration proposal would reach 54.5 mpg by the 2025 model year, and by rising fuel prices. Aluminum weighs about a third as much as steel, but it is more difficult to stamp and more expensive. A pound of raw aluminum ranges from 90 cents to $1, roughly twice the cost of mild steel. Boron steel -- a high-strength steel sometimes used in roof pillars -- can cost 70 to 80 cents a pound. The switch to aluminum is gaining momentum. According to a May report by the consulting firm Ducker Worldwide, the average vehicle built in North America will have about 400 pounds of aluminum in 2015, up from 343 pounds this year. Aluminum sheet could be especially useful for full-sized pickups, which will have to shed as much as 800 pounds to meet fuel economy standards, according to Richard Schultz, managing director of Ducker Worldwide. Schultz estimates that automakers will be able to make those weight reductions by 2020. General Motors is expected to be a major user. According to Schultz, GM will use aluminum hoods on its next-generation Chevrolet Silverado pickup, which debuts in 2013. That will save about 25 pounds per vehicle, Schultz estimates. But the big weight reduction will come when automakers switch to aluminum bodies-in-white. The first to switch were luxury automakers, which could more easily pass along aluminum's added cost to consumers. The newly launched Mercedes SL roadster, for example, has a 560-pound aluminum body-in-white that cut 300 pounds from the vehicle's weight, according to Novelis, which supplies the aluminum. Jaguar and Audi also have produced aluminum cars, and the Audi A2 offers a glimpse of aluminum's weight-saving potential. When the aluminum A2 was introduced in 1999, it boasted a 1,973-pound curb weight. The car was discontinued in 2005. But Audi displayed a four-seat A2 concept in September at the Frankfurt auto show and announced plans to reintroduce it in 2013. While European automakers have taken the lead, tough U.S. fuel economy standards will force all automakers in the market to consider aluminum-bodied cars. Alcoa's Schep says: "Every carmaker in the United States is actively looking at an all-aluminum body-in-white."